Don't settle for the small, tinny audio offered by so many PC speakers. Upgrade to a set of Bose PC speakers and enjoy deep, immersive audio that will enhance your favourite music, games and video. Bose have long been regarded as one of the world's leading speaker manufacturers and their exceptional PC speakers only enhance that well-deserved reputation. The Bose Companion® 20 2.0 speakers are everything you want from PC speakers - neatly compact, stylishly sleek and surprisingly powerful. These sophisticated speakers are equipped with TrueSpace technology that's designed to reproduce wide and lifelike audio, so you can enjoy your multimedia in immersive quality. Smart Bose PC speaker design means that room-filling sound is possible without a subwoofer. It's a far cry from the weak, lifeless audio quality often associated with PC speakers. The Companion® 20 2.0 speakers accompany stunning sound with suitably smart design and usability. These ingenious speakers are equipped with a versatile control pod so you can enjoy easy audio control. The rotational design allows for quick volume adjustment and the single touch mute button adds convenience. The control pod even has a headphone jack and an extra audio port for optional audio connection to another device. All our Bose PC speakers deliver incredibly dynamic audio thanks to the brand's renowned focus on innovative acoustic technology, so look no further if you aren't satisfied with your PC's audio performance. 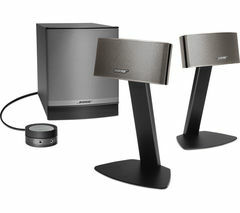 With a pair of Bose speakers your favourite games, music and videos will sound better than ever. Check out our complete range of audio products to browse more speakers, including the latest B&O, Sony and Sonos speakers. You'll find plenty more PC speakers that pack a surprising audio punch as well as multi-room speaker setups that will transform your entire home into an audiophile's paradise.